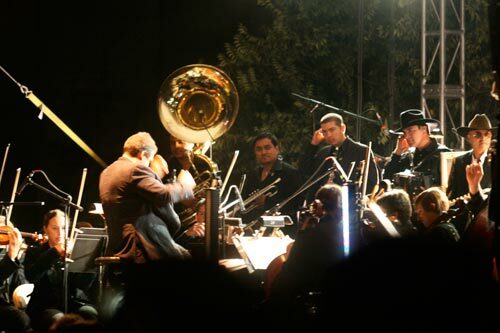 La Orquesta de Baja California joined forces with Nortec Collective artists Bostich and Fussible on Sunday for a free concert in the plaza outside Tijuana’s cultural center. It was the final day of Entijuanarte, a three-day contemporary art festival featuring work ranging from painting and photography to digital and performance arts. I’ve seen Nortec Collective artists perform before and it usually involves a lot of sitting behind laptops. But Sunday was a much improved live performance. Nortec’s signature sound comes from layering samples of banda brass over electronic beats. 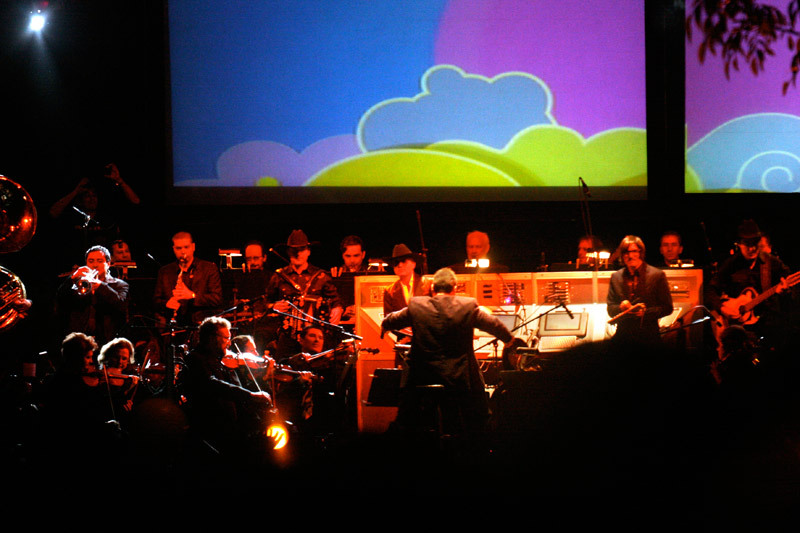 And for a city increasingly recognized for cultural hybridity, it’s only more fitting to have a high-brow orchestra perform pop culture riffs alongside electronic music for free in the public space. The concert started with “Tijuana Makes Me Happy,” which garnered cheers despite a bad audio mix early on. “Tijuana Sound Machine,” the title track from the latest release by Bostich and Fussible, was well received; the song’s music video recycles the city’s campy heritage in a fun, sequin-covered spectacle. 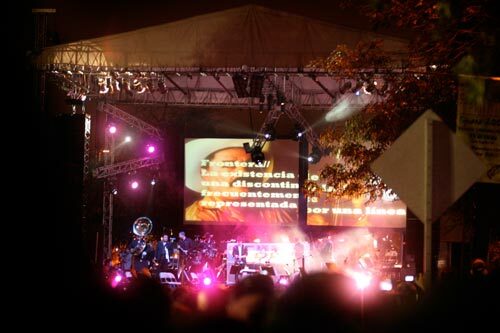 In its early stages, the Nortec Collective seemed to be more widely received internationally than on its home turf. 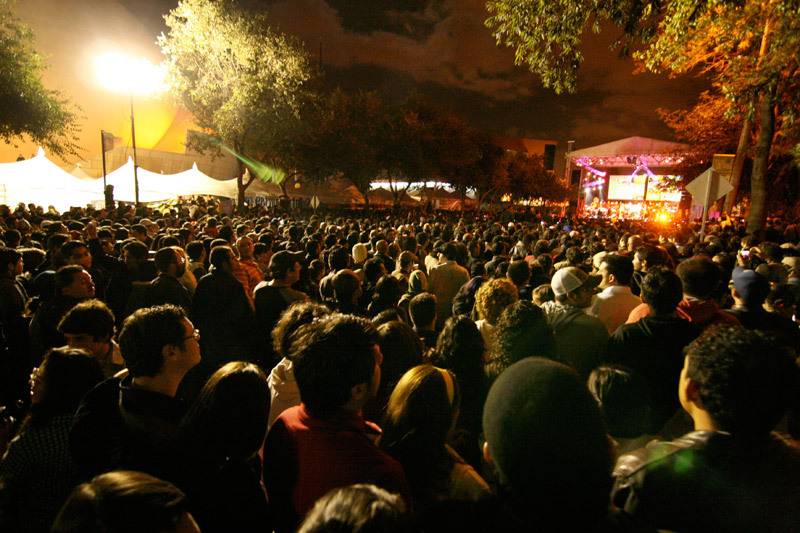 But that seems to be changing as the youth embrace the city as their own, taking pride in Tijuana’s cultural identity. Here is a funny bit of KPBS history for you. I had these guys come and perform at one of my KPBS outreach events about 7 or 8 years ago! I think we paid them a couple hundred bucks and there were about 65 people present. They were so great to work with. I’m happy to see them finding success.